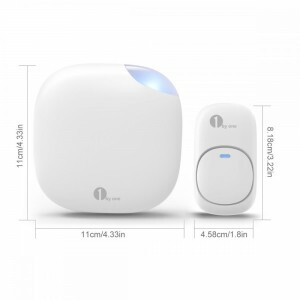 The 1byone Easy Chime wireless doorbell is a great option for easily adding a doorbell to your home or apartment without having to deal with wiring. It has an optional LED flash and 36 melodies to choose from. I give the 1byone Easy Chime a 5/5 rating. I tested the “One Plug-in & One Battery Operated” option of 1byone’s Easy Chime 2 receiver 1 remote wireless doorbell with LED flash and 36 melodies. 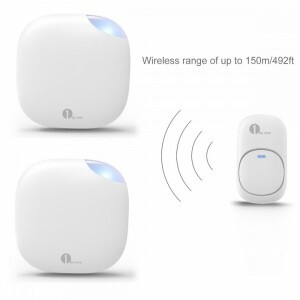 This wireless doorbell unit is really easy to set up. While setting it up, be ready for how loud it is. When you take the remote apart, be sure that the rubber ring stays on the outside edge of the case; this helps weatherproof the remote housing. The remote can be stuck to the outside of your home via the included double-sided tape. The outlet plugin unit does what is says–plugs into the outlet. The battery operated unit can either be propped up using the included “coin” or can be mounted to the wall using the included anchor and screws. Battery unit uses two included AA batteries. Remote used included CR2032 watch battery. Can be used with any other “Easy Chime” product. Audio and visual alerts in 3 different modes: “beep” without LED indicator (only sound), “beep” with LED indicator (sound and LED flash), LED indicator without “beep” (only LED flash). Volume can be adjusted to Low, Medium, and High. Each receiver can be configured with different tones. You could use different music to distinguish visitors in different locations; however, you would need two buy 2 of these products so that you will have 2 remotes.